So you’re thinking about investing in your health and fitness by purchasing a workout bench for your home? Firstly, let me start by saying, this is a very wise choice! Even better now that you can buy a cheap weight bench for under $100, thanks to competition driving the prices down. Some gym memberships are also pretty cheap now, so if you were unsure whether to join a gym or have your own home gym, read our guide on having a home gym vs a gym membership. With so many different types of workout benches available it can be difficult to find one that’s the perfect fit for you. Choosing the right home weight bench for you is partly down to what your requirements are. Those who are limited on space might be better off with a stow away weight bench. Owning a home workout bench is one of the must have equipment for your home gym, so if you were going to start with anything, start with this! There are so many exercises you can do with a workout bench, it’s not just limited to bench pressing. There are several types of benches to consider which our Top 10 Best Workout Benches 2019 comparison table below will show. Our table will also break down the features of each bench which should give you enough guidance. 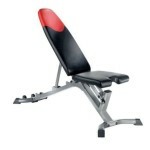 Furthermore, you can have a look at our help guide on what type of weight bench should you buy? We’ve also provided an individual review of each of the workout benches which you can see by clicking here. These workout bench reviews will provide you with more in-depth guidance as to which bench may be more suitable for you. Made from heavy duty commercial quality steel. Sturdy 500 lb user weight capacity. 6 adjustable positions (flat, 30°, 45°, 60° and 90°) including decline position (-17°). Seat adjustable to 2 positions. 30 year frame warranty and 1 year on upholstery. No purchasable attachments available which can limit the use of the bench. 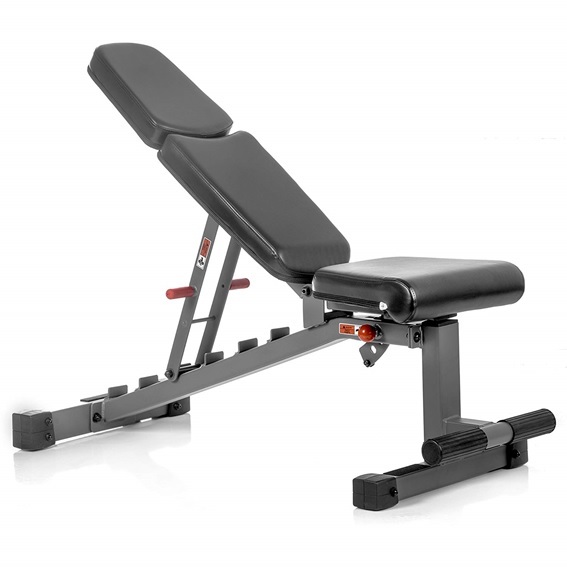 One of the longest standing market leaders, it’s no surprise to see the SelectTech 5.1 voted as our best adjustable workout bench. 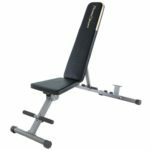 This solid workout bench from the highly reputable Bowflex offers great support and sturdiness, with its heavy duty commercial quality steel construction. 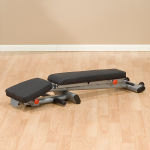 The 6 adjustable positions enable you to perform over 30 exercises! A big noticeable improvement from the SelectTech 3.1 bench is that the seat can be adjusted to 2 positions. 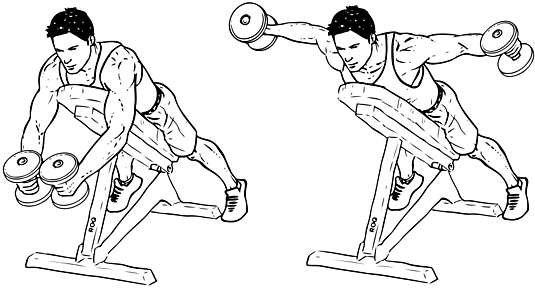 One for flat benching and one for incline which is perfect for securing you in a better position for incline exercises. With the leg hold down brace, you lock yourself in position when doing decline exercises such as sit ups or decline bench press, of course this attachment can be removed if you prefer training without it. Ideal for people of all fitness levels, but more so those who are punching above their weight! You’ll have to pay a little bit extra for this but knowing it comes with a 30 year frame warranty, you know you’re pretty much covered should anything go wrong. Supports up to 800 lbs user weight. Adjustable to 6 positions ranging from -20° to 80°. Lightweight only weighing 35 lbs. Bench doesn’t actually have a completely flat position, there’s a slight decline. Don’t be misled by the title, some might think it can support up to 1000 lbs but it only falls slightly short with a still large weight capacity of a whopping 800 lbs! Not bad for a foldable weight bench, yes that’s right it can also conveniently fold away to save space when you’re not using it. It’s definitely one of the best home workout benches for under $100, however, this bench might be more suited towards taller and wider users as the size of the seat is pretty big. Also, the flat position is not completely flat, there is a slight decline but this might not make a difference to some people. It might be a mystery how this lightweight 35 lb frame can support up to 800 lbs, but we’re not going to complain since it does the job. Although the seat is fixed in one position, the front leg can be adjusted to 2 positions which essentially changes the angle of the seat and backrest. Leg hold down bar can be adjusted to 3 different positions which is ideal for different user heights. Adjustable to 7 positions (flat, 15°, 30°, 45°, 60° and 85°) and a decline position (-17°). 10 year frame warranty and 1 year on all parts. Towards the top of the bench it gets more narrow which might be an issue for broader users. When it comes to finding a decent folding adjustable workout bench, the Powerline PFID125X has always been a popular choice. At a high of only 9 inches when folded, it can conveniently fold away and tucked either under the bed or behind the door, no one would even know! Also, only weighing 45 lbs and has built-in transportation wheels for easy mobility. Despite that, this is still a solid unit that can support up to 500 lbs of user weight. For those of you who hates building and assembling things, you’ll be pleased to hear that this bench requires no assembly whatsoever! You can literally get your workout in straight away. A decline angle of -17° means it can probably qualify as an abdominal bench as well, which eliminates you from having to buy one separately. The price has however increased over the years and now it’s not much cheaper than the Body Solid GFID225, which some people might prefer due to it offering a lifetime warranty! Having said that, the Powerline still offers a 10 year warranty which is nothing to turn your nose up at. Maximum user weight capacity of 300 lbs. 4 adjustable positions (flat, 45°, and 90°) including a decline position (-10°). Removable leg hold down brace for decline exercises. 15 year frame warranty and 1 year on upholstery. Seat can’t be adjusted to different positions. If you’re not quite ready for the SelectTech 5.1 yet then perhaps the SelectTech 3.1 might be a better option. Not as tough as its big brother, but it can still deliver! A very solid entry level workout bench that will guide you through to when you become a veteran. One of the downsides is that the seat is fixed in one place and so can’t be adjusted which might make doing incline exercises slightly uncomfortable for some users. However, Bowflex has made this improvement on the SelectTech 5.1! Also, the decline position can be a bit steeper as it only declines to -10°. 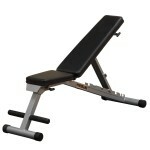 Overall, this is a well-built solid bench, but, for around the same price you can buy more versatile workout benches. With the Bowflex 3.1, you’re also paying for the support of a solid and very reputable brand hence the warranty period. 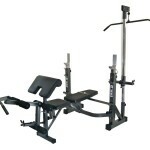 Included attachments: 6 roll leg developer, rolled preacher pad, curl yoke and squat stand. Squat rack has adjustable safety spotters. User capacity of 300 lbs and maximum weight capacity of 600 lbs. Not sturdy enough for users who can lift really heavy weights. Versatility at its best! With the included squat rack, you can literally do twice as many exercises and work on nearly every muscle group with this weight bench. Not to mention the leg developer, preacher pad and curl yoke that all comes with the package! This really is a multi-functional bench. 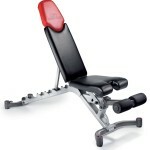 One of the best things about adjustable workout bench is that you can use it for both dumbbells and barbells. Another very useful feature is the safety spotters which are attached to the squat stand. Perfect for when you’re bench pressing and don’t have a spotter (although it’s still better to have a spotter) or squatting. Very reasonably priced considering what it includes, so essentially you end up saving money, since it’d cost you a lot more if you had to buy it all separately. However, one of the major downfalls is the warranty period being only 90 days! For anyone who’s too strong for their own good though this bench might not be ideal as it has a combined maximum capacity of 600 lbs. Despite this the bench is made from heavy gauge tubular steel, so it’s still a sturdy unit. Commercial grade heavy duty 2” x 3” steel construction. 7 different adjustment positions including decline. Heavy 600 lbs user capacity. Lifetime warranty for home use. Seat is fixed in one position. Buy with confidence as the GFID225 is one of the very few home workout benches that offer a lifetime warranty but for home use only. Its solid 2 x 3” oval tubing frame guarantees it can endure very heavy workouts for a lifetime. The ladder style adjustable positions mean you can effortlessly change the positioning. It’d also be good if the seat was adjustable, but, it’s fixed in one position. This can be quite an issue for some users, especially when you’re lifting heavy weights on an incline, as your body tends to slide a little. Quite disappointing Body Solid hasn’t improved the design to include this feature. A slightly bigger initial investment will be required but if you’re serious about keeping in shape in the future years, its lifetime warranty will give you peace of mind. One of the most solid folding workout benches available. 500 lb (400 lbs for incline positions) maximum weight capacity including the user. 7 different adjustable back positions. Band posts fixed to the bottom can be used for various exercises using resistant bands. Only comes with a 30 day warranty period! Perhaps not the best workout bench for very tall users, but for those who are no taller than 6 ft 2, you’ll reap the benefits from this versatile exercise bench. The back can be adjusted to 7 positions and the seat can be adjusted to 3 different positions which can be beneficial for your workouts. Most workout benches even from the big brands lack this feature where the seat angle can’t be adjusted at all! The hooks on the bottom of the bench allows you to hook resistant bands onto it, giving this bench a multi-purpose use. We mentioned that CAP only offers a 30 day warranty period which is quite poor considering the Powerline PFID125X doesn’t cost much more and they offer a 10 year warranty on the frame. Also, there is no decline position which might not be an issue for some users. Please note that the 500 lb maximum weight capacity is the total weight limit, that includes the weight of yourself. So, perhaps if you’re planning to lift really heavy, you might be better off with a bench that supports a higher weight capacity. For the seat to be able to adjust to 3 positions at such an affordable price, this will probably seal the deal for some people. One of the very few other benches to have this feature is the Bowflex 5.1, but, you’ll have to fork out a lot more money for that bench. 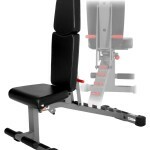 Adjustable to flat, incline and decline positions. 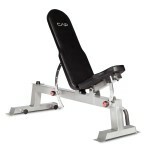 Leg lift, lat tower and preacher curl attachments included. Able to purchase additional attachments. 1 year limited warranty on frame and 90 days on labour. Maximum user weight capacity is 275 lbs. Unless you have a massive garage or plenty of space for a home gym, a lat pulldown machine is unlikely to be first on the list. 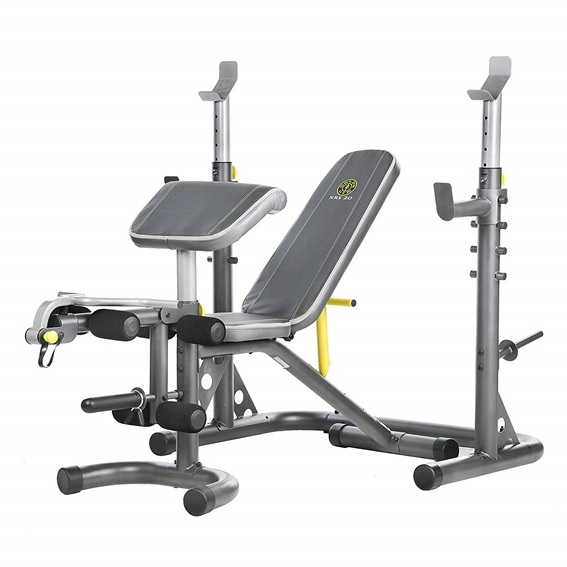 However, with the Phoenix 99226 you don’t have to worry about having enough space as it includes a lat tower attachment, as well as a leg lift and preacher curl attachment. 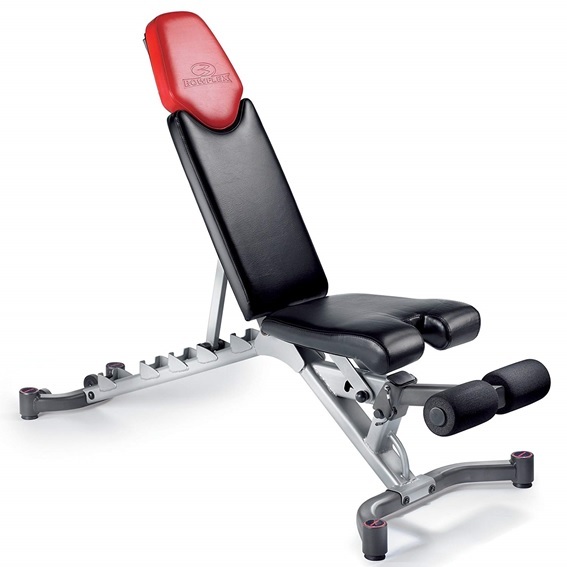 Equipped with plenty of attachments as well as many additional attachments which can be purchased, this Olympic workout bench allows you to do enough exercises making it pretty much like a mini home gym. The squat rack can be used for both benching and squats. Despite being made from heavy duty steel, the maximum user weight is towards the lower end, so for the big lads, it’s a no no! Made from premium steel construction. Bench press rack has adjustable safety spotters. Adjustable seat slider and back pad. Peacher pad and leg development attachments included. Included a 2 year limited warranty. No spotter? No problem. The Marcy Diamond Elite has an adjustable safety bar catch which means that you can push yourself to your limits. That’s not all it can do though, the rear pegs on the squat stand can be used for squats, and not to mention the preacher curl pad and leg developer attachments. The adjustable seat slider allows you to adjust the positioning of the seat and backrest, you can even go nearly as high as 90°, perfect for a shoulder workout! Users that are going to be lifting heavy and that are also heavy themselves, this Olympic bench probably won’t be suitable. 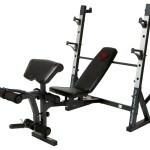 You’ll need quite a bit more room with this Olympic bench but if you like training on your own then it’s ideal for you! But at least you can keep your workout area tidy by storing your weight plates on the storage posts, which is great for space efficiency. Total weight capacity of 1500 lbs. Constructed from heavy duty 11 gauge 2” x 3” rectangular frame. Tear resistant 3” extra thick duracraft pad seat. Back pad adjustable to 7 positions and seat can be adjusted to 3 positions. 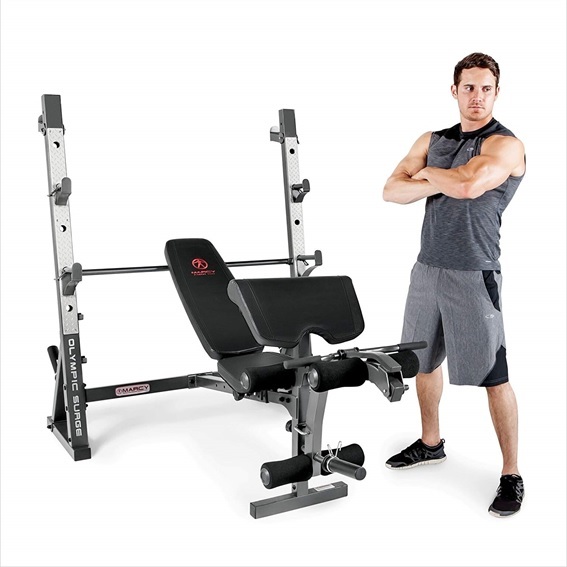 There’s not many home exercises benches out there that can support a massive 1500 lb weight capacity and offers lifetime warranty for home use. Maybe a bit too much for some people, many people will be happy to settle for something not as sturdy but save some money. 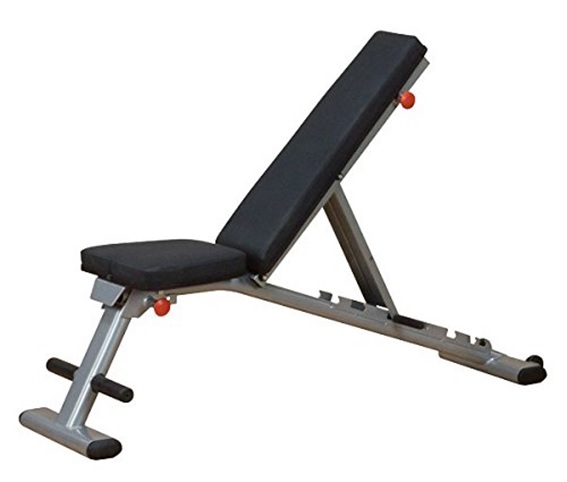 For those who can lift some serious amount of weight, you’d be pleased to hear this is a very sturdy adjustable weight bench thanks to its U-Shaped base providing extra stability. In regards to the price, it is towards the higher end but it is worth the money for those who actually need a bench this study. Having said that, the ergonomic seat can conveniently adjust to 3 different positions with the backrest adjusting to 7 positions with the decline position being -20°, perfect for sit ups. So you’re not just paying for quality but for versatility also. Deciding which home weight bench to buy can be challenging if you’re not familiar with the features and functions, but with our help hopefully this will give you a better understanding. Before you decide on a bench, consider the following factors as this can help you choose a more suitable option. When it comes to the price, don’t always go for the cheapest option because further down the line if you’re still using the bench (which you should be! ), you will wish you would have spent a bit more money buying a better quality bench. Depending on how often you’re going to be using it, set your budget accordingly. For instance, if you’re goal is to build muscle and gain size and you plan to use the bench 4-5 times a week then set a higher budget. On the other hand, if you only plan to use the bench once a week just to maintain your physique then perhaps there’s no need to fork out loads of cash to buy the top of the range weight bench. 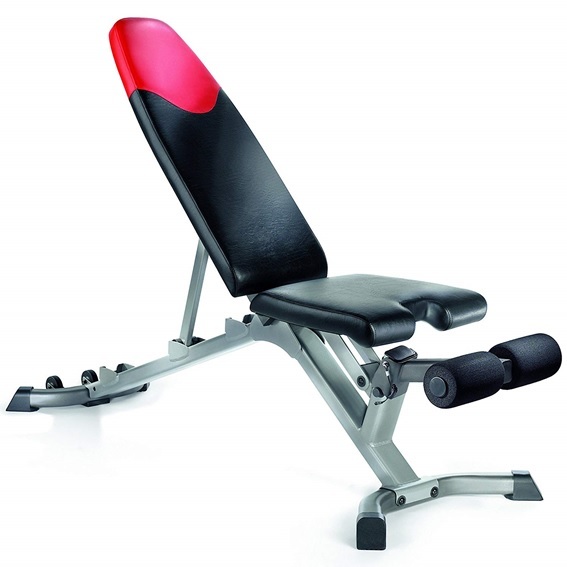 As well as choosing a home workout bench that’s suitable for you, you’ll also need to take into consideration what type of weights you’d prefer to use. 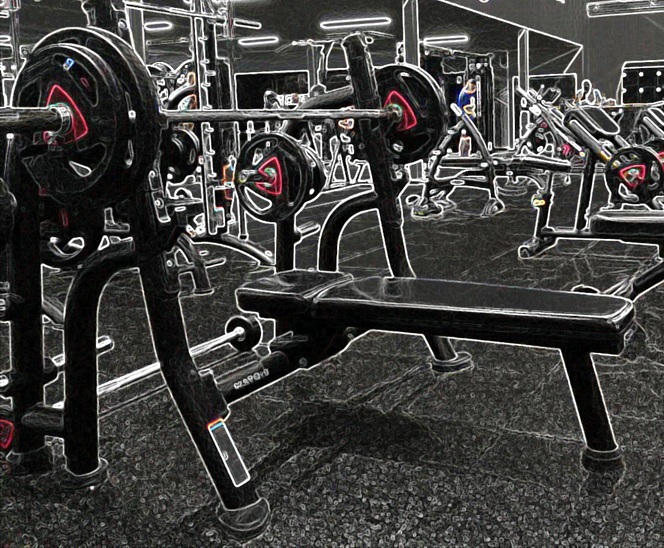 This may help you decide or determine the type of workout bench to buy. You may have a preference as to what type of weights you prefer using either dumbbells which can be either adjustable dumbbells or regular dumbbells or the Olympic bar. Whichever one you prefer you’ll need to choose the type of bench that’ll accommodate the type of weights. Our home weight bench comparison table will specify whether the bench is suitable for dumbbells or Olympic bar or both. Your available workout space will also play a factor in what home weight bench you’re limited to. Check out our guide on adjustable weight bench vs Olympic weight bench to get more of an insight on what might be more suited to you. How durable and sturdy the workout bench is will largely determine how long it’ll last in the years to come. Expect to pay a bit more for a sturdy bench that’ll last you for a very long time. The construction and quality of the materials used to build the exercise bench will indicate how strong and sturdy it’s going to be. If you’re planning to use the bench for heavy lifting or you’re quite heavy yourself then you should opt for a heavy duty workout bench. 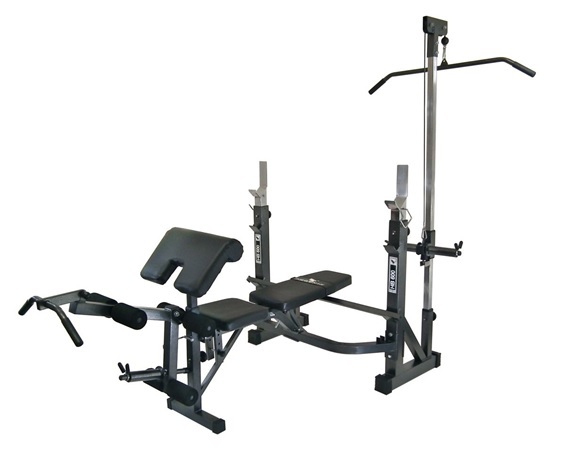 In our opinion, the Body Solid GFID 225 is the best heavy duty workout bench since it has a 1000lb weight capacity. On the other hand, the Fitness Reality 1000 super max is more affordable and can support up to 800lbs. More positions essentially enable you to do more exercises as certain exercises will require a specific angle. So it’s worth thinking about what exercises you want to use the bench for such as incline bench press, shoulder press, dumbbell rear delt raise etc. 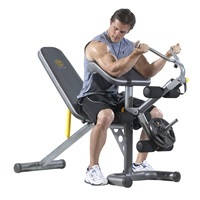 For complete beginners or novices, perhaps you can even check a list of exercises you can do using a weight bench, so you have a better idea of what will be the best adjustable workout bench for yourself. 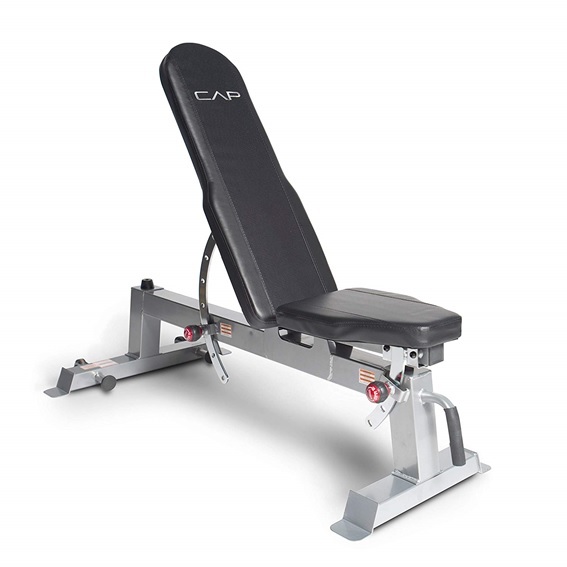 Having a bench that’s compatible with additional attachments will allow you to expand your workout options. Not every bench will be compatible with attachments. Although buying attachments cost more money, you don’t have to buy it straight away, you can wait until you feel you want a change of workout and try something new! 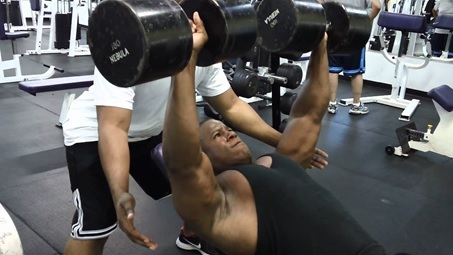 Attachments may also allow you to work other muscle groups that the bench alone might not be able to accommodate. The warranty a manufacturer offers kind of tells you how confident they are in their product. Some manufacturers will offer a 10 year or even lifetime warranty! Of course the warranty might be quite limited in what’s actually covered, so you will need to double check this. Nonetheless, a more comprehensive warranty condition should give you more confidence in the product. Before you start to fork out some money for gym equipment, the thought of joining a gym might have crossed your mind. If you’re unsure which option would be better for you, then we’ve weighed up the differences and pros & cons between the two. Hopefully with our guidance you can make up your mind. Only requires the initial upfront investment, maintenance is generally very minimal. Able to access whenever you want without having to commute to the gym. Don’t have to queue up waiting for certain equipment/machines to become available. If you’re by yourself, you probably won’t have a spotter available. Can possibly sell your gym equipment if it’s no longer needed. Having to pay a lump sum of money upfront. Lacking a “gym” atmosphere which can help motivate you. Need to have the space available. Although there are many cheap gyms now, usually a membership will still end up costing you more over time. Some gym users might be very knowledgeable and can even help you. That “gym” vibe can really help motivate you. Much wider choice of machines to use that you wouldn’t have access to at home. Having to commute to the gym – You can get stuck in traffic depending on where you live. May have to queue up to use some equipment/machines. We hope our guide has put you one step closer to finding the best home weight bench in 2019. It can be quite a long process when there are so many different factors to take into account, for some people it might be very straightforward. Another option that could be worth a try is to join up the gym for a day/month if you can or even request for a free day pass, if you don’t ask you don’t get! Try out the benches they have there to feel which type you prefer. Bear in mind though that the gym equipment are usually commercial graded, the benches you can buy for home use are generally not going to be as strong, although some might not be far off.